By now, you may have heard the U. S. recycling industry has hit a speed bump. In the last couple of years, our biggest recyclable materials importer, China, has shifted a lot of its manufacturing to other Asian countries. 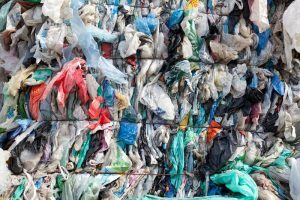 It no longer requires as much raw material as it used to, and not only that, its leaders have enacted more stringent contamination restrictions on the recyclables they accept. When they needed a lot of recyclables for their manufacturing such as metals, plastics, and cardboard, they accepted contaminated loads – recyclables mixed up with other non-recyclable trash. Now that they are less greedy for our stuff, they are demanding cleaner loads of sorted materials. Some U. S. waste companies complain that China’s standards are impossible to meet. What does that mean for you and me? After years of throwing all our recyclables in one bin (it’s called “co-mingling” in the jargon), we now must be more careful about what we toss. By throwing non-recyclable stuff in our bins, we run the risk of contaminating our loads. The new restrictions place more pressure on waste haulers to landfill those loads. Both Republic Services and Waste Management, two of the largest waste haulers in the world with customers in Marshall County, have begun education campaigns to help their customers avoid contamination. Republic Services has a new slogan: “Empty, Clean & Dry.” It’s self-explanatory: empty your containers, rinse them out, and put them in the bin after they have dried. No liquids, please! And no food waste, either. 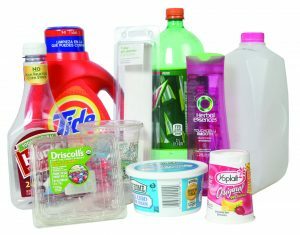 Waste Management’s battle cry is similar: “Recycle Often, Recycle Right.” Like Republic, they are emphasizing materials that are free of ooze, dry, and clean. Personally speaking, I prefer clean stuff in my bin, because I hate the odor of old food or a sticky bin. Most residential recyclers I meet agree with this level of tidiness. The problem isn’t the state of the bin contents, though; it’s the bin contents themselves. What can be recycled in Marshall County? What should we be putting in our bins? And how do we find out? Plastics 1, 2, and 5 are all recyclable in Marshall County. For Republic Services, call 574-842-4719. For Waste Management, call 866-797-9018. No plastic bags. Comingled loads are sorted mechanically. Plastic bags gum up the machinery and can shut down a whole line. Dispose of plastic bags (grocery bags, bread bags, newspaper bags) at your grocery store. Even better: skip the bag and bring your own tote. Some items are never recyclable. These include: plastic bags, toys, clothing, diapers, and yard waste. Never throw these materials in your bin—even if they are plastic. Just because a plastic item has a recycle symbol on it doesn’t mean it’s recyclable in Marshall County. Currently, haulers in our county are taking plastics 1, 2, and 5: you can find the number on the bottom of the item. Translated, this means items such as plastic bottles and jars, milk or juice jugs, margarine and yogurt tubs. Never recycle shrink wrap, Ziploc bags, plastic pouches, shipping plastic (like the plastic around your new earbuds). When in doubt, throw it out. It’s better rather than contaminating the whole load. Recycling is still worth doing, despite the speed bumps. By reducing contamination at the curb, we can ensure that our stuff goes back into circulation and not just to an early death at the landfill.